Lock Change / Rekey - Locksmiths & Safemen Security Hardware Ltd.
Aus Lock & Safe is a leading Locksmith, Safe & Security company. We specialize in commercial security, master key systems, residential security & safes. Our work is 100% guaranteed! Are your locks old or increasingly difficult to operate and want to have them replaced? Do you want to beef up your security with new locks, or simply to install a more decorative set? 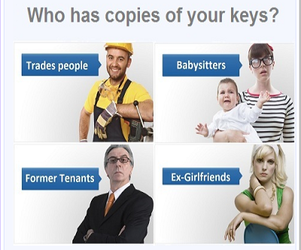 Locksmiths and Safemen Security is the place to call when you want to replace locks in your home, office, or business. Our locksmiths can install a wide variety of residential and commercial locks, including mortise locks, garage door locks, shed locks, deadbolts, handle sets and door knobs, cylinder locks, sliding door locks, and window locks, etc. Changing your locks is one of the best and easiest security upgrades when you have security concerns and are looking to have assured protection for your family or your place of business. We carry a wide selection of quality locks from some of the leading brands, including Schlage, Medeco, Assa,and Falcon. Give us a call when you need to fit new locks and we will do it for you fast. Our locksmiths are licensed, insured, and bonded. Locksmiths and Safemen Security provides first-rate services anytime you want to have your locks replaced, re-keyed, coded or re-coded, etc. Our security experts are available to offer a consultation if you need help to select new locks to secure your home, office, or business. We provide rekey services at Locksmiths & Safemen for a wide variety of locks, to homeowners, businesses, and rental property owners. Rekeyings locks is a quick cost-effective option than replacing your locks. Anytime you need to rekey the locks in your home, office or business, guve us a call. Whether you need to rekey your locks for security reasons, or just your convenience; our experienced Locksmiths can do it for you quickly and expertly. You do not need to change your lock or locks to protect your property; our locksmiths will rekey the locks at a fraction of the cost. 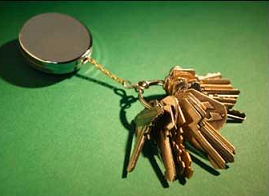 Rekeying a lock involves changing the tumblers in the mechanism, meaning that the old keys that previously opened the lock will not open it anymore. If you just moved into a new home, or you loaned out a key that wasn't returned, etc rekeying the locks in your home will ensure that any keys in the wrong hands cannot be used to gain unauthorized access into your home, office or place of business. If you find that you are carrying a heavy bunch of keys around for the locks in your home or business, rekeying the locks will help cut down the clutter and confusion. We can rekey all your locks to use one master key, or only the exterior locks on the property, etc to suit your convenience. We provide master rekeying for rental properties configured to your specific needs if you have apartment buildings, or an office building.